Thank you to everyone who voted in the poll. 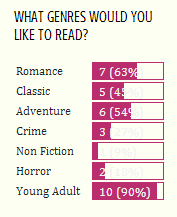 The votes are now closed and I think it's fairly obvious what genres won. They're just a few, but I think that way we should be able to fit in all the young adult that everyone clearly wants to read lol.